A one-piece suit cover the whole torso, arms and legs. They usually have one or sometimes two zippers down the front of the suit, sometimes additionally closed by a flap with velcro or buttons, and often have a belt at the waist. Sometimes, the suit has built-in suspenders on the inside for added support. 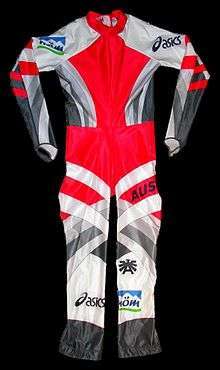 One-piece ski suits are often just made as a shell layer, with the skier adding warm underwear of own choice adapted to the current weather situation. Other suits may be padded for warmth, but when intended for skiing they are still not as insulated as a snowmobile suit. ↑ The Snowsuit Effort in Detroit and The Snowsuit Fund in Ottawa are examples of this.